A social bookmarking icon is located at the right side of the screen for your targeted audience to follow for some queries. The posted articles are easy to locate because of the recent post, categories, blog archive tabs. Moreover, the articles are listed with an excerpt shown. Furthermore, you do not have to worry if your customers are using phones or computers because it has a responsive web design that adapts to the device’s screen. Running ad campaigns on your website is an effective idea to increase awareness of your business and affiliated businesses. Affiliate marketing can be the easiest yet fastest way to earn extra money. You can also directly sell some of your space ads to help other businesses promote their product and service. Advertise those brands, products or services that are related to your content. 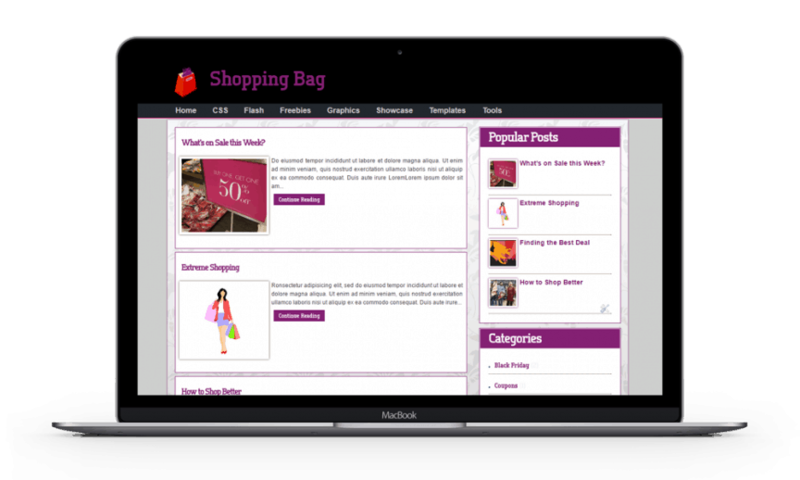 Download Shopping Bag Template, it’s for FREE! For those who want to share their thoughts and opinions through the web, it is a must to download this FREE XML blogger layout. When you use this template for your blog, it is already given that you will have an increase in web traffic. Do you want to try the Shopping Bag layout? Click the Demo button below. If you have already tried the template, we would love to hear something from you. Leave your feedback in the comment section below. Furthermore, if you have a friend or colleague who loves to share their thoughts in just a single line, share this XML blogger layout to them. Shopping Bag	Overall rating:	5	out of 5 based on 1	reviews. Great blogger theme for foodies and those who love taking photos of everything they eat! Show your love as a true Apple fan boy (or girl) with this simple blogger theme, free!